Receding from our 30th Reunion! Reunion dates: June 8–10, 2007. For more information, contact Reunion Chair Chip Wilker, or contact Karen Bernier of the Alumni Office (phone 610-328-8404). 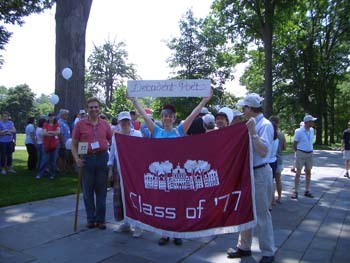 Schedule and other practical information can be found on the College Alumni page, where there is a general Alumni Weekend page and a specifically Class of 1977 page. 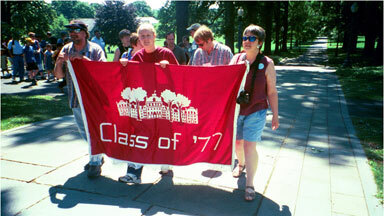 The Class of 1977 page has a nice set of photos from the 25th reunion in 2002. (Those photos, by Dave Schroeder, are also here.) The College also administers a class discussion list. 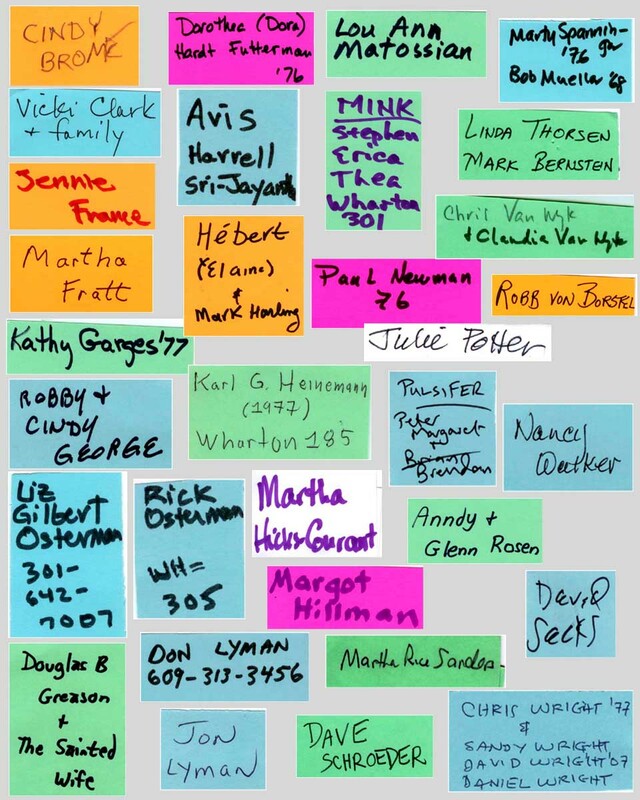 You can send an email to all subscribing class members by addressing it to class77@alumni-office.swarthmore.edu To subscribe to the list, send a request to the list administrator. Class of 1977 Souvenirs for Sale! To make the weekend even more festive, the reunion committee has created some special class reunion souvenirs. 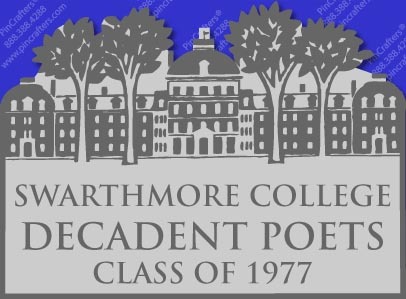 Get your “Decadent Poets” baseball caps and lapel pins, just like those worn during the reunion! Click to read all about it! A Multi-artist Exhibit in the List gallery including works by Alice Zinnes. Not to be missed! These events take place after the class dinner on Saturday night, and are open to all free of charge. 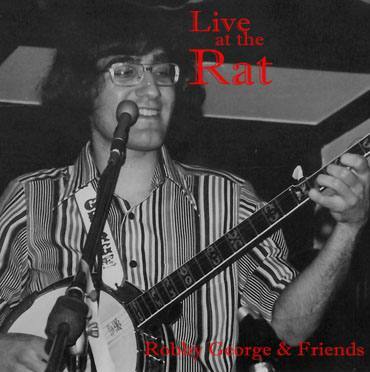 In Lang Recital Hall: A concert by Robby George and Friends. Fun for the whole family! 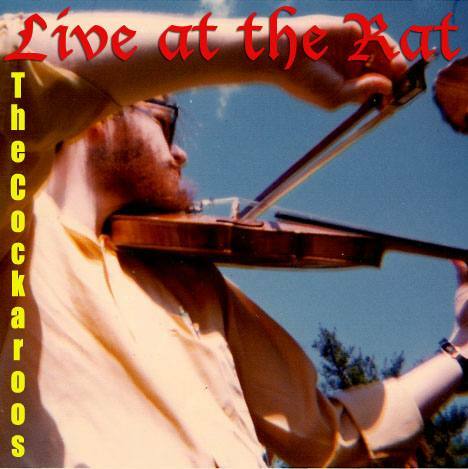 At the Olde Club: Nathan and the Narwhals play for your dancing pleasure. (The Olde Club is conveniently located behind the tennis courts, not far from the D.U. and Phi Omicron Psi houses and between the Kitao Student Art Gallery and the Women's Resource Center. Confused? It's #35 on the campus map). Date of last modification: July 22, 2007.